The Everest and Annapurna regions of Nepal are considered one of the world’s ‘must see’ destination for those trekkers who opt for adventurous trekking. This trek combines two of the popular treks in the impressive regions of Everest and Annapurna. It also includes the cultural visits in Kathmandu valley. 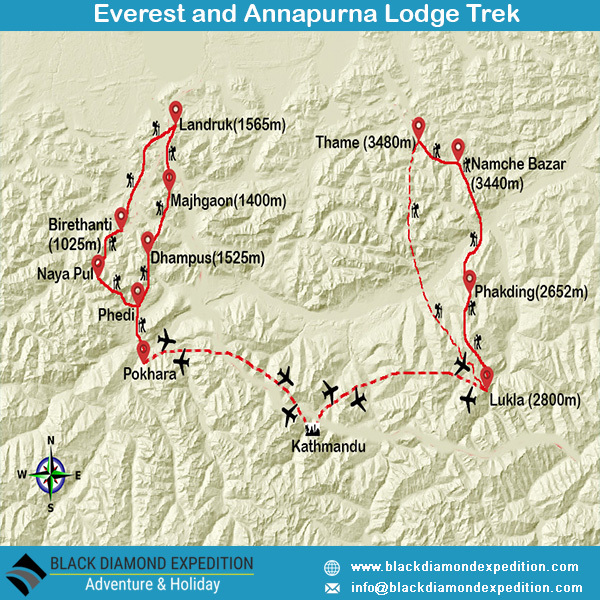 The short flights to both Everest and Annapurna regions adds extra spices to the trek. Trek to Annapurna, one of the most popular trekking destinations in Nepal, offers an opportunity to explore rural life combined with spectacular mountain views. The trek to the Everest not only offers opportunity to explore the culture and traditions of the Sherpa village but also provides with the ancient monasteries and the imposing view of Mount Everest. The trek in the Everest region leads us up to Namche bazaar often known as the Sherpa capital, where we explore this awesome town. We also visit the nearby villages of Khunde and Khumjung for the mesmerizing views of Mt. Everest and Mt. Ama Dablam. In the Annapurnas, the trail leads us through the foothills and the picturesque villages and a sublime backdrop of snowy peaks. The itinerary is based on quality accommodation throughout the trekking of the "Comfort Lodge" chain. The journey concludes with cultural visits to temples and monuments in Kathmandu, a World Heritage Site by UNESCO, to give you an insight into the richness and variety of traditions and religions in Nepal. In a nutshell, the flight up to Lukla will live long in the memory and the flight along the chain of the Himalaya to Pokhara shows off the central part of the Nepal-Himalaya to a great effect. A BDEx representative will meet all clients at the airport in Kathmandu and will arrange the transfer to the group’s hotel. BDEx Land Only package services begin with this transfer. After checking in, the rest of the day is free and the group will formally meet together for the evening meal which will be taken in one of the city’s famous establishments. Flight to Lukla/ Downhill trek to Phakding (2610m). An early start for the flight to the high airstrip in the Everest region known as Lukla. This incredible flight is a highlight of the trip, taking us through the Himalayan foothills and offering perhaps a glimpse of Everest as we come into land on the tiny airstrip at Lukla. After meeting our porters for this section of our trip, we will take lunch and then start our trek with an easy, mostly downhill leg, from Lukla to Phakding. This trek takes us through Sherpa villages and individual farms. Many Sherpas now make their living exclusively from trekking and there are many tea-stalls and basic lodges where it is possible to stop for a drink. We will also pass by many stones intricately carved with prayers in the evocative Tibetan script, as well as prayer wheels of all sizes. Everywhere in the valley colourful strings of prayer flags flutter from high points and bridges. Dropping down to a trail above the Dudh Koshi river we head north to reach our Yeti Mountain Home lodge at Phakding. The elevation at this first night's halt is actually lower than Lukla at 2610 metres. Trek to Namche Bazaar (3400m). Leaving Phakding we head north along the west bank of the Dudh Koshi river, passing several lodges and tea houses to a high thin waterfall at Benkar (2710m). You will experience sensational views of Thamserku (6623m) here. Beyond Benkar, we cross the river on a high suspension bridge and continue along the east bank below high cliffs clothed in rhododendron forest. The trail undulates as we negotiate several side valleys bringing melt water from the high peaks. Crossing the Kyashar Khola, we make a final climb to the village of Monjo (2835m) where we pass the entrance to the Sagamartha National Park. We then have a short but steep descent on stone steps to another suspension bridge where we cross once more to the west bank of the Dudh Koshi. We continue up the wooded valley on a good trail and cross the river again before reaching a confluence of rivers one coming down from Thame and the other from the main Khumbu Valley. We make a final crossing here on a spectacular high suspension bridge and then begin an hour and half long ascent to Namche on a wide switch-back trail. This is the sting in the tail of today's trek otherwise a gentle ascent, and one of the steepest of the trip. About half an hour below Namche, we gain our first views of Everest. On arrival in Namche, we can take a breather in one of the town's coffee shops before finishing off the climb. The location of our lodge is superb giving us a bird's eye view over Namche and across the Valley to the serrated ridges of the Kongde range, while the magnificent peak of Thamserku (6623m) rises as a back drop. Just a short walk away is a classic view of Ama Dablam, one of the most beautiful mountains in all Nepal and of Lhotse and Everest. Namche Bazaar is tucked away between 2 ridges amongst the giant peaks of the Khumbu. An ancient market place where goods from as far away as Tibet were and still are traded, Namche today boasts an abundance of lodges, cafes, bars and souvenir shops. Close to our lodge is the internationally known Museum of Sherpa Culture and the traditional villages of Khunde (3840m) and Khumjung are a highly recommended half-day excursion. We spend a second night at our lodge in Namche Bazaar. Trek above the Bhote Khosi River and Thame (3820m). After breakfast at our lodge, we start the day with a 2 to 3 hour walk through forest of spruce, juniper and pine to the village of Thamo. This trail is much less used by trekkers and we will immediately notice the difference. It is, however, an important trail which leads all the way to Tibet via the Nangpa La on the shoulder of Cho Oyu (8012m). On today's trek, we are likely to see few other trekkers. We stop for our lunch in Thamo which is the home village of the Ang Rita Sherpa, who has overcome the summit of Everest 10 times without oxygen. After lunch, we continue walking for another 2 hours to arrive at a deep gorge where the Bhote Koshi River thunders through the narrow defile. We cross a sturdy bridge spanning the gorge to reach Thame (3800m). This important village is the home of many famous mountaineers including Tensing Norgay the first man to reach the summit of Everest along with Sir Edmund Hillary. Apa Sherpa who has reached the summit at least 18 times lives here now. The village is very picturesque and also has a magnificent 16th century Nyingmapa gompa (monastery) built by Lama Rolwa Dorje. We check into our deluxe rooms with breathtaking views of Thamserku and Kusum Kanguru. Flight to Pokhara via Kathmandu to Pokhara/ Trek to Birethanti (1025m). We will be up early today to catch the spectacular flight back to Kathmandu. Here, we connect with the 30 minute flight to Pokhara. This equally spectacular flight offers views of the Langtang, Manaslu and Annapurna ranges. We are met on arrival at Pokhara Airport and taken by vehicle (1 hour) to the start of our walk. Together with our new local team, we then follow a trail through the lower foothills of the Annapurnas with surrounding views of the Pokhara Valley. Finally we descend to the very comfortable Ker and Downey Sanctuary Lodge in the valley of the Modi Khola. Lunch is at the lodge and there is the option in the afternoon to walk to the nearby village of Birenthanti (1025m). Alternatively, you can rest at the lodge and do a bit of local exploration. After breakfast at the lodge, we have a pleasant morning of trekking alongside the Modi Khola (the river that flows out of the Annapurna Sanctuary). Ahead of us, there are great views of the Annapurna peaks and of the sacred 'Fish Tail' peak. We cross a suspension bridge to the opposite side of the river and from here it's about an hour's trek on a combination of a switchback trail and stone steps to reach the village of Landruk (1565m). Landruk affords more glorious views of the Annapurna range. We arrive at the Ker and Downey La Bee Lodge in time for lunch. After lunch, there is an option to accompany with the guide on a sightseeing tour of this pretty mountain settlement. This morning, we start out trekking through the unspoilt village of Patlekhet. Our walk takes us through sub-tropical forests that include orchids, rhododendrons and magnolias. Along the way, we will stop at the village of Pothana where many Tibetan traders live and sell their souvenirs. Once again, we aim to reach our next lodge in time for lunch. Our accommodation for the night is at the small, but splendid Ker and Downey Basanta Lodge, where we are treated to sweeping views of the entire Annapurna Range. After lunch at the lodge there will be an optional walk through the old village of Dhampus. After a leisurely breakfast at our lodge, we have a short downhill walk of about an hour and a half along a scenic ridge to the farmland and scattered houses of the broad Yangdi Khola Valley. Here, we meet the road and our waiting vehicle and make the 30-minute transfer-drive to Pokhara, where we check in at a luxurious resort . The afternoon is free for independent exploration of this friendly, lakeside town, before returning to the hotel for dinner. Flight to Kathmandu/ Independent sightseeing. We take the morning flight to Kathmandu. The streets of Kathmandu are considered one of the major hangout attractions for any tourist who visit Nepal. This hangout presents a fascinating mosaic of shops, cafes and restaurants, food markets and street vendors, as well as a bewildering array of colourful temples and shrines. This evening we will have a dinner in one of Kathmandu's excellent restaurants. Free day in Kathmandu: Sightseeing, Shopping or Relaxing. A day to relax in the gardens or beside the pool of a hotel, or for a further independent sightseeing. No matter whether it is your first trip or you have come to Nepal many times, your tour remains incomplete unless you walk along the streets of Kathmandu. You will accumulate a great fun from visiting fascinating mosaic of shops, cafes and restaurants, food markets and street vendors, as well as a bewildering array of colourful temples and shrines. Kathmandu is a very safe city (provided you watch out for the traffic) and exploring on your own is great fun. This evening, we will have a celebratory dinner to mark the end of a most excellent trip. BDEx Land Only package services end after breakfast. Transfers to Kathmandu Airport are provided. There are lots of extensions that can easily be added to your holiday in Nepal. Why not pre-book a simple day-tour in the Kathmandu Valley, or a multi-day excursion to one of the important wildlife reserves at Chitwan or Bardia. Extension packages are also available to include a visit to neighbouring Tibet or Bhutan. Contact our office for details.